IN MANDALAY in central Myanmar, another bout of bloody sectarian violence between Buddhists and Muslims recently left two dead and many injured. The riot was sparked by rumours that two Muslims had raped a Buddhist woman. The deaths brought to about 240 the number killed in sectarian clashes over the past two years. Most of the victims were Muslims. Myanmar is just one of several South-East Asian countries recently forced to confront old questions of race and religion. In Malaysia, a prominent Malay Muslim leader, Abdullah Zaik Abdul Rahman, has been charged with sedition for accusing ethnic Chinese, a minority in Malaysia, of being “trespassers”. And in Indonesia the winner of the presidential election, Joko Widodo, or Jokowi, squeaked home after a huge early lead over his rival evaporated, in part because of unfounded rumours that he was a Christian Chinese rather than in fact a good Javanese Muslim. These events may appear disparate, but they reflect a common thread running through the history of race and religion in South-East Asia. Specifically, they reflect the legacy of those colonial territories which one British academic and colonial administrator, John Furnivall, first characterised as “plural societies”. The British and Dutch Asian empires that gave rise to such societies have long gone, but the consequences of their creation remain. Indeed, the concept of the plural society is more relevant than ever for understanding and even predicting the course of events in the region, and especially in Myanmar—or Burma, as it was when Furnivall lived and worked there. Furnivall was a Fabian socialist who arrived as an administrator in 1902 and married a local Burmese. Though he left the colony in 1931, he returned in 1948 to advise the first post-independence governments as well. Furnivall’s original description of the plural society is very different from the way “pluralism” has come to be understood in the West. Rather than referring approvingly to a rainbow of ethnicities choosing freely to live together, Furnivall coined the term to criticise the imposition of immigrant races on indigenous societies in the name of commerce and free trade. This occurred most obviously during the 19th century in the ports of the British and Dutch seaborne empires, in littoral cities such as Akyab (now Sittwe) and Rangoon (Yangon) in Burma, in Penang and Singapore of the Straits Settlements, and in Batavia (now Jakarta) on the island of Java, capital of the Dutch East Indies. Eventually more formal colonial rule was extended by conquest to the interiors of these places, carrying the plural society with it. For the most part, the immigrants, often destitute, who poured into these territories under European rule were Chinese. But millions of South Asians, many of them Muslims, migrated as well, especially to Burma, then administered by Britain as part of its Indian empire. Indians migrated in large numbers throughout the Malay world. The immigrants often provided manual labour, in Malaya’s copper mines and rubber plantations, for instance. 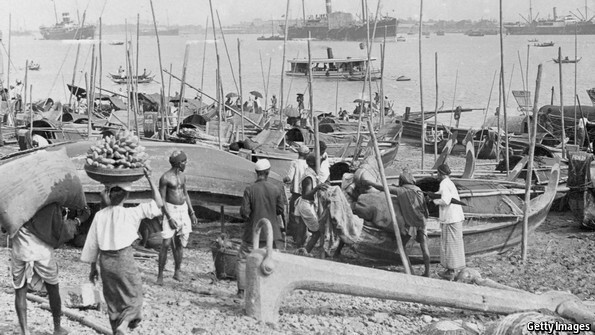 But they also contributed to the entrepreneurial zest and trading connections that helped to create the wealth and vitality of imperial entrepots such as Rangoon and Singapore. Colonial Rangoon was a majority-Indian city by the 1920s. It boasted Armenian, Jewish and Chinese communities. The Chilean poet Pablo Neruda, who was consul there at the time, described Rangoon as “a city of blood, dreams and gold”. But as Furnivall saw it, the wealth came mostly at the expense of the indigenous Burmans in Burma, the Malays in Malaysia, the Javanese in Java and so on. Indeed, many such groups felt themselves to be elbowed aside by foreigners who came in under colonial protection. For all that the plural society produced wealth, for Furnivall it was essentially brittle and unstable, lacking in any “social will” or shared sense of community. “It is in the strictest sense a medley”, he wrote; the different races “mix but do not combine. Each group holds by its own religion, its own culture and language, its own ideas and ways. As individuals they meet, but only in the market-place, in buying and selling.” He worried, therefore, about what would happen once the coercive power of the colonial authority was gone. Colonial protection was the chief impediment to immigrants being attacked by resentful indigenous peoples, or even clashing among themselves. Post-colonial societies have been dealing with this worry ever since. Race riots in Malaysia and Singapore in 1969 pitted Malay against Chinese. They seemed to confirm Furnivall’s worst fears about “the whole society relapsing into anarchy” once the colonial power had gone. The new elites’ response was often to replace colonial authoritarianism with their own brand. In Malaysia and Singapore many of the old oppressive laws from colonial days have been defended as the surest way to keep in check the resentments and antagonisms that follow from the plural society. In both places it has also, as a happy consequence, helped keep the same ruling parties in power since independence. By contrast, the post-colonial military governments of Myanmar tried a different strategy. Rather than devising a way to cope with the plural society, they tried to dismantle it. The junta that seized power in 1962 expelled hundreds of thousands of Indians, Chinese and other non-Burmese in an attempt to smash the plural society and create an artificially homogenous Burman one. This, however, was even more coercive than the plural society it was meant to replace. The Burman-dominated military governments tried to impose a policy of “Burmanisation” on the country’s other ethnic groups such as the Kachin and Karen, officially recognised as indigenous, provoking long-running civil wars. That is how things stayed until the democratic reforms of the present government, initiated in 2011. A loosening of central control has seemed to lead to the “anarchy” between races that Furnivall had feared. In western Myanmar, the (Buddhist) Rakhine are finishing the ethnic cleansing begun in the 1960s. They are clearing what remains of the plural society, mainly Muslims, from Sittwe. In other commercial centres, such as Mandalay, where the plural society has limped on for decades, some Burmans, led by chauvinist Buddhist monks, are whipping up similar antagonisms. Regrettably, a supposedly modernising Myanmar government is now supporting the chauvinists against the South Asians and Muslims. In a new democratic era it has an election to win. It faces annihilation at the hands of Aung San Suu Kyi’s popular National League for Democracy in next year’s general election, so it is exploiting old resentments against the plural society for electoral gain. The army-backed ruling party is supporting four pieces of legislation, proposed by the monks, to protect “race and religion”, implicitly that of the Burman Buddhist majority against an imagined Muslim takeover. The laws would make it very hard for people to convert to other religions or for Buddhist women to marry Muslim men. Thus the ruling party hopes to turn the election into a debate about Burman rights and privileges rather than democracy. It presents Miss Suu Kyi with a quandary. Many foreigners criticise the Nobel peace-prize winner for not standing up more for the Rohingyas in Rakhine and other Muslims. She knows that if she did speak out she would forfeit much sympathy among Burmans and undermine her hopes of restoring democracy—and coming to power. The generals’ strategy might help them, but it will jeopardise the vital contribution that industrious and commercially-minded immigrant communities could still make to the impoverished country. Yangon’s plural society, which prompted Furnivall to think about all this in the first place, was, after all, a precursor to today’s highly global cities, with all the riches that accrue to them. It is no coincidence that Burma’s precipitous economic decline followed the generals’ attempts to dismantle the plural society in the 1960s. Nearly all the evidence points to the benefits of diversity and immigration in terms of innovation and productivity. If the chief motivation for Myanmar’s generals to start reforming the country was in order to revive a decrepit economy, they ought to want a flourishing plural society, though without the former colonial coercion, more than anything else.